This article gives an overview of the Big Thunder Mountain Railroad front seat, back seat, and the seats in general. The Big Thunder Mountain Railroad attraction that this article covers is for the ride in Frontierland at the Magic Kingdom, Walt Disney World Resort, Bay Lake, Florida. The front seats on Big Thunder Mountain Railroad (BTMRR) are located directly behind the train. Since the front seats are directly behind the train, it is a little harder to see what is in front of the train when compared to seats that are farther back. In addition, the front seat seems to have less of a whiplash type of movement than the backseats. The front seating area for Big Thunder Mountain Railroad includes two seats in a bench / booth style arrangement. This is the same arrangement for the other seats on the ride. The back seats on Big Thunder Mountain Railroad are located in the last car, which is the fifth car on the train. The backseat gives an interesting view of the whole train and the ride. It is easier the see what is in front of the ride when compared to the front seats. As expected, the seating arrangements are exactly the same as the front seats, two persons per row. Below are some videos of the ride from the backseat and the front seats. The seating arrangement for Big Thunder Mountain Railroad is setup with 5 cars that include three rows of seats per car. In each row, guests sit side by side. The Big Thunder Mountain Railroad seats are padded and there is also side padding to help when hitting the sides of the car while the ride is in motion. A lap bar extends the full length of the seats in each row. The seats are comfortable for a roller coaster from our viewpoint. 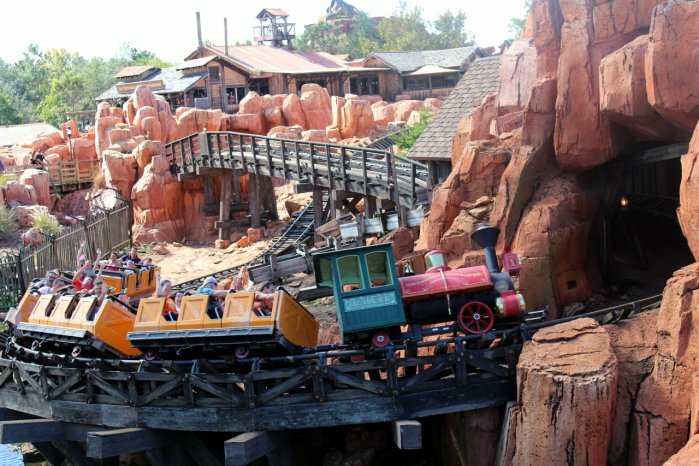 To learn more about Big Thunder Mountain Railroad you can visit the other pages about the roller coaster that are on the site.